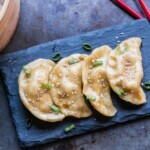 Paleo Dim Sum Recipe - Oh, The Things We'll Make! The other day I was having cravings for pasta or something similar, but I didn't want to have the usual rice noodles that I occasionally eat when the rest of my family eats homemade wheat pasta. Ever since going gluten free and mostly grain free, I don't have that many cravings for bread or pasta, but every once in a while it's bound to happen. I was determined that I wanted to make a sort of grain free pasta, and started experimenting with different mixes of grain free flours to try to get the right consistency for making pasta. I ended up coming up with a combination that made a tasty pasta, but the mixture was a bit too delicate for pulling though the pasta maker as I have always done with traditional wheat flour. This pasta worked better with a rolling pin and cutting by hand. The dough itself is quite delicate, but the pasta, once boiled, actually has a pretty solid consistency resembling wheat pasta al dente; the flavor isn't that different either! As I was rolling out the flour and looking through my fridge, trying to decide what I wanted to make myself to eat, I though about using the pasta dough to make something I've wanted to try making for quite some time. I decided to try to make myself a paleo dim sum recipe. To be honest, I wasn't quite sure what I was getting myself into, or if it would work out, but I kept going anyway. I'm so glad I did because I can truly say that I enjoyed this recipe. You can probably tell that, despite being an American girl living in Spain, I like to try making and paleo-fying a lot of Asian recipes. I don't know why, but I guess it's because I'm attracted to the exotic flavors like ginger, soy sauce, litchis and matcha. With that introduction, let me share with you my paleo dim sum recipe. Make a ball of the mixture and knead it as best you can. If needed, add a little bit of hot water. I like to add hot water because it seems to help make the dough stick together better. Let the dough set while you begin to make the filling. 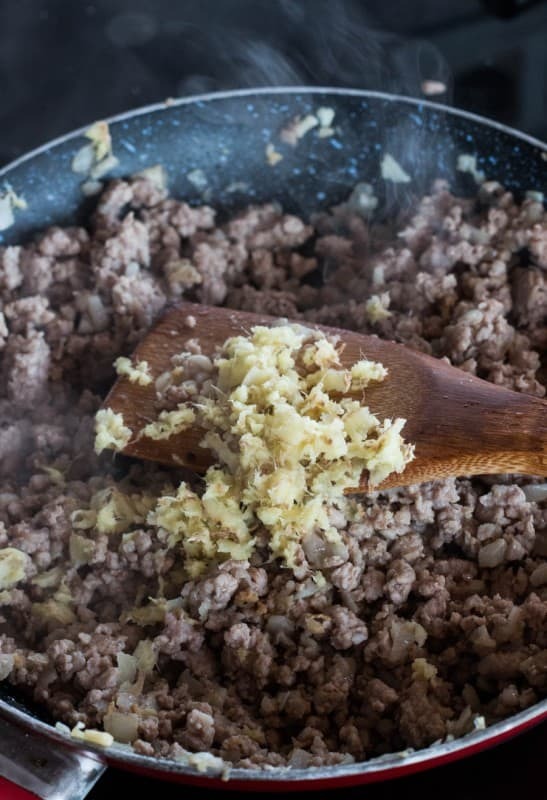 Brown the ground pork in a frying pan over high heat, adding in the minced garlic cloves and salt and pepper to taste once browned. Grate your ginger root and it to your filling mixture. I like to add a lot of ginger to give it a favor punch, but you can add as much as you like. Roll out your dough with a rolling pin. If you're having issues with the dough sticking, I've found it easiest to roll the dough out between two layers of parchment or wax paper. try to get a very thin layer of the pasta dough. Use a circular cookie cutter (or the edges of a glass or whatever you have available) to cut out circles of pasta dough. Fold the dough circles in half and pinch the edges of the dough together with your fingers to seal the potstickers closed. Keep steaming until the pasta changes texture and looks cooked (Or you can taste one to check for doneness.) It took me about 10-15 minutes to steam each batch. Remove from the heat, and serve with a dipping sauce of your choice. I mixed together a little soy sauce, sesame oil and Asian plum vinegar, but to make it totally paleo you can substitute out the soy sauce for coconut amino or something else. Just an FYI. Saying you are making dim sum is like saying you are making brunch. Its a meal, not a dish. I’ve never tried it, but I can’t imagine why not! Going to try these tonight, might attempt to fry them since I don’t think I have a steamer! I’ll report back. I hope they go well for you! They also are quite nice using the raw meat within the wrappers. I need to make this again with videos and update the post with new ways to do this. I’ve found that the size of the egg can really affect the consistency of the wrappers, too, so I’d like to try to find a better way of writing out the recipe so that it more consistently turns out the right consistency without fiddling too much with it. Tried this recipe tonight. Not really happy with. Dough turned out alright, although it didn’t looked like yours. Mine was more looking like peanut butter…..although I followed recipe. Also I noticed how important it is to have the same thickness with each and everyone. The sauce turned out the best. I’ve been meaning to update this recipe as I tried to recreate it for video and it came out differently- mainly because egg sizes can vary so much. My eggs used to be pretty much the same size, but as my hens are aging, I’m getting a wide variety of egg sizes and am noticing how much that can change the outcome of a recipe! I need to write up a better way to get the recipe easy to follow exactly as written no matter what egg size you use! I’m sorry you didn’t like it that much. I think once you get it down, it can be a family favorite. I’ve also since experimented with using the meat raw within the dumplings and I liked it much better that way. The recipe look amazing so I decided too try it. We love Dim Sum! The dough started out great. I was excited. I rolled it out on wax paper. Then when I went to peel it off the paper it ripped the paper and got stuck in the dough. It became a pain to save. I was so sad. But the filling ous good. And we’re going to use it for the my man’s famous wontons. Thanks for the recipe. I’m sorry it didn’t work out for me. You win some you lose some. I was wanting to make a video for this post, and tried to make this again the other day. I had the same issue that you had this second time and had to add in more tapioca starch and almond flour to get a workable dough. I think this is probably due to the fact that when I wrote this post, my hens were on the younger side and were laying smaller eggs. The problem with writing up a recipe for a certain number of eggs is that egg sizer can wildly vary. I think you’ll find that adding more of the flours will help you get to the right consistency. That said, I am going to try to redo the recipe with my current eggs and give more tips for getting the dough right. I also want to say that I have since tried steaming them with the raw filling inside, and actually like that method much more. I’m just finishing up a kitchen remodel, so I’m a bit behind on everything right now, but it’s definitely on my to-do list for the very near future! I’m glad that you at least enjoyed the filling! I should add that I have made this recipe more than twice. (It didn’t really sound that way from the way I answered your comment)- I just don’t normally follow a recipe myself. I add flour until I get the right consistency. When I wrote up the recipe, I measured out what worked for me that day, and I have to admit that I didn’t try using the specific measurements again until the day I tried recording the video. The next time I make this, I will try to measure it out again to see what my measurements end up being, and will update the post with my findings. I will then try to repeat it several times to make sure the measurements work well repeatedly. I have both tapioca starch and cassava flour. Which is best to use please? I’ve actually been working on updating this recipe lately, because I wanted to add video, and have been doing a lot of new trials with it. I use tapioca starch, like the common ones that are normally found at Asian and Latin American supermarkets. I haven’t been able to find a cassava flour here in Spain, but my guess is that either would work just fine. I think when I originally wrote this recipe, we were just getting small eggs from our hens, so I used 2 for the amount of flour in the recipe, but now I’m finding that with 2 larger eggs, you’ll end up with a sticky dough, and may need to add more of the flours to get it to come together. I’m also finding that it works out much better to add the raw meat to the pot stickers before steaming. You can use a lot more filling, and they taste even better. The only thing that has kept me from updating yet, is I’m trying to work out the exact amount of flour to eggs that works out best for me. Obviously it still may need adjusting, according to the size eggs you buy and even the humidity where you live, but I’d like to get it closer to what would work out well for most people without having to add anything. Hello Tracy, I live near Barcelona and have been able to find cassava flour at a wonderful store in Granollers called “la Perla” (c/ Goya 5). They import it, package it and distribute it themselves under the “King Africa” brand. I don’t know if you are in this area, but if so definitely check out the store. I’ve been able to find some great cassave/yuca products for our paleo/anti-inflammatory diet. I’m in Denia, right smack between Valencia and Alicante. Thanks for the heads up, though. I’ll look it up. It’s very quick to mix up the dough, and it’s also a quick process to cook them. I used cooked meat inside so as not to have to worry about if everything gets cooked through properly, so it’s a matter of making sure the wrapper is cooked to your liking. The step that takes the longest is wrapping the dumplings. My first ones were pretty slow, but I got a lot quicker as I went along. How long does it take in total to make this? Sorry if I didn’t see it. They look so good! Can’t wait to try them this week!! These are potstickers, dim sum isn’t one singular food. Dim sum is the term we use for certain types of Cantonese brunch foods. That said, when I reintroduce eggs I’d love to try this recipe. Ha! Thanks for the information! I remember debating what to call them when I wrote the recipe, and ended up choosing “dim sum” because I realized that a lot of people use the terms interchangeably and were searching for “dim sum” recipes on Google without a lot of recipes to choose from. Perhaps I should add both names to the title, and give an explanation in the beginning to clear things up. Is there a technical reason you browned the pork first or a preference? When making regular glutenfied ones, the pork is usually raw going in, but cook throughout during steaming. Wondering if you chose to do this or is this dough doesn’t allow the contents to cook in the time allotted via steaming? I personally haven’t tried using raw pork. I ended up making a big batch of the (cooked) filling, and used it for other things too. We like to fill tortillas with ground beef or pork and veggies quite often or inside a quesadilla. For me it’s just easier to cook it all at once, and then use some of the cooked meat in the dim sum. That way I don’t have to worry about if it was cooked long enough or not. I don’t imagine that there would be any reason you would have to cook it first, but since I haven’t personally tried it raw yet, I can’t promise you how well it will cook within this dough. If you do try it, I’d love to hear how it works out. Maybe next time I could leave just a bit of the filling mixture raw to try to make a few that way to see how it goes. I hope that helps you. Merry Christmas! Thank you so much for the recipe! Just made them tonight they were delicious ? Only thing I need to change is to separate them more. They definitely stick together and don’t come apart easily. Mine broke apart and only few survived. I’m confident next time I’ll have full pot stickers ? How many carbs are these? Do you think that these could be cooked like potstickers? I like the crunch that postickers have! But these look delicious either way. Do you mean the type that are fried in oil? I haven’t personally tried it, but I imagine that they would fry up nicely. I do breading for frying using a mixture of almond flour and tapioca starch and it fries up nicely and even gets crispy. I actually like the way it turns out better than wheat flour breading. Next time I’ll have to save a few to test it out. Way too much tapioca for me. Can’t use that much. Is there anything I can sub for that? have you tried making ravioli with this pasta recipe? I wondering if it will stay closed if boiled. Actually I haven’t tried it yet, but I’ve been meaning to try it because I want to remake my chocolate ravioli recipe with a grain free pasta.